What is AlertBot Website Monitoring? AlertBot website monitoring is a fully-integrated, cloud-based monitoring platform designed to monitor websites, mobile sites, web applications, and services. It’s an easy-to-use software that simulates user website characteristics from numerous locations using genuine browsers to determine whether it’s functioning properly. 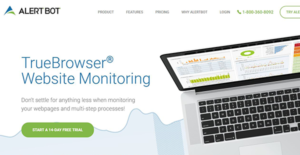 The application leverages the proprietary TrueBrowser technology that integrates real web browser testing with advanced error detection to offer the most accurate and comprehensive website monitoring. The solution provides a wide range of tools that enable website owners to monitor mission-critical applications for performance issues and errors that hinder seamless user experience. It delivers trended and graphed data that enables IT professionals, to make informed IT decisions. Some of its core features include website monitoring, multi-step synthetic monitoring, server monitoring, mobile monitoring, and protocol monitoring. AlertBot Website Monitoring is a reliable software that offers no overwhelming learning curves or complicated interfaces. Its intuitive interface allows users to effortlessly set up and manage their services with a goal to monitor multi-step process (including signups, checkouts, login areas, shopping carts, control panels, etc.) and web pages with ease. The platform equips website owners with vital tools that make it easy to delight customers with better websites. AlertBot Website Monitoring boasts the Waterfall FX technology designed to simplify error detections. The platform leverages this technology to dissect every object on the webpage to identify the aspects causing problems and keep the user updated when they happen. Once an error is detected, the software initiates a chain of validation tests to find its source and provide in-depth details about the error. It screens the error from different geographical locations, examines the web server as the possible source of error, and performs additional TCP/IP testing to pinpoint potential network hardware issues. Another advantage of AlertBot Website Monitoring is its real-time notifications and alerts. When the program finds errors, it notifies and alerts the website owners through multiple communication channels such as SMS, email, and automated phone calls. The email notifications provide in-depth error information with details such as a screenshot of the issue, multiple tests, and others that make it easy for the owner to resolve the problem intelligently. If you are considering AlertBot Website Monitoring it could also be sensible to check out other subcategories of Best Network Management Software listed in our database of B2B software reviews. It is crucial to realize that almost no service in the Network Management Software category will be an ideal solution able to meet all the goals of different company types, sizes and industries. It may be a good idea to read a few AlertBot Website Monitoring reviews first as some solutions can perform well just in a really narrow group of applications or be prepared with a really specific industry in mind. Others can function with an idea of being easy and intuitive and consequently lack complex functionalities needed by more experienced users. There are also services that support a wide group of users and offer a rich feature set, however this usually comes at a higher price of such a service. Ensure you're aware of your requirements so that you buy a software that offers all the elements you search for. How Much Does AlertBot Website Monitoring Cost? AlertBot Website Monitoring enterprise pricing structure has four pricing plans. Give the details a look, and select the best plan for your business. We realize that when you make a decision to buy Network Management Software it’s important not only to see how experts evaluate it in their reviews, but also to find out if the real people and companies that buy it are actually satisfied with the product. That’s why we’ve created our behavior-based Customer Satisfaction Algorithm™ that gathers customer reviews, comments and AlertBot Website Monitoring reviews across a wide range of social media sites. The data is then presented in an easy to digest form showing how many people had positive and negative experience with AlertBot Website Monitoring. With that information at hand you should be equipped to make an informed buying decision that you won’t regret. What are AlertBot Website Monitoring pricing details? What integrations are available for AlertBot Website Monitoring?